Bethel Lutheran Church is a new church building adjacent to the existing Bethel Lutheran School in Morton. BLDD developed a master plan that would relocate their existing church in order to combine their school and church ministries on one campus. 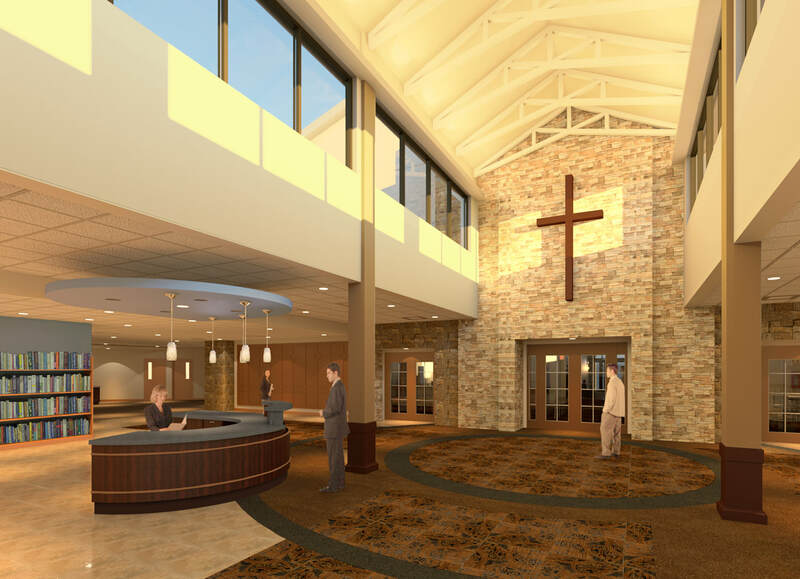 Phase 1 of the 65,300 sf master plan includes a 28,285 sf church building that will house a new sanctuary with balcony, parish hall, administrative office suite, nursery, and children’s education space. Phase 1 also includes a 7,000 sf addition to the school for future classrooms and a storm refuge room. The Sanctuary is designed specifically for the church’s three types of worship services: traditional with an organ, contemporary with a band and a combination of the two that uses all the instruments. The Narthex is a welcoming space with natural light from the clerestory highlighting the 25 foot high wall of natural stone. It is the church’s gathering space with a Welcome Center and a coffee and donut counter. The space is enhanced with exposed steel trusses at the high ceilings, and wood and stone details throughout.